Clearance Sale: **READY TO SHIP** Minimalist Necklace. Pyrite. 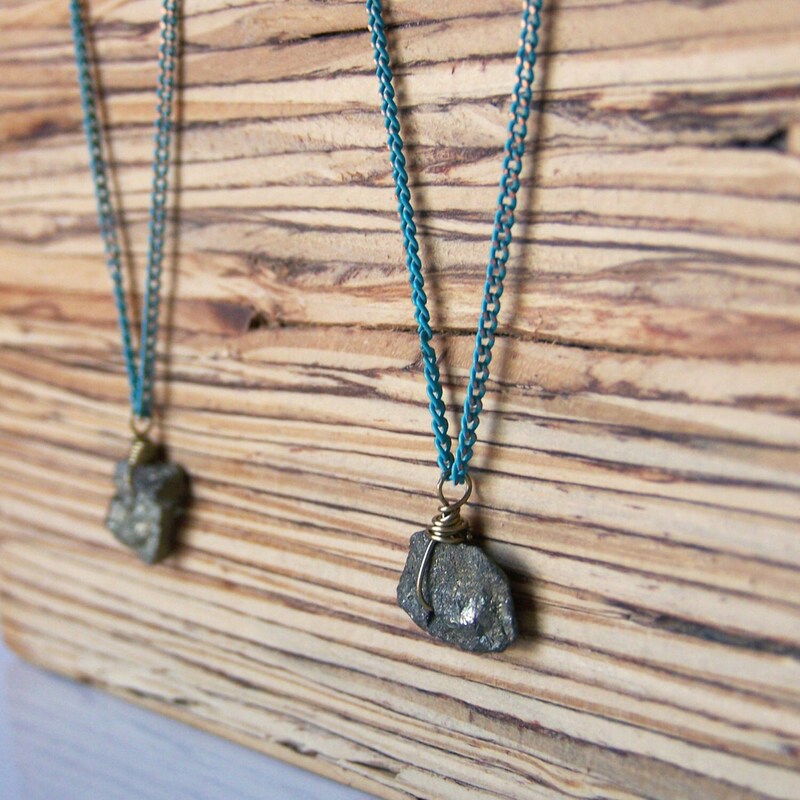 A delicate minimalist necklace, finished with a rough-cut pyrite stone. This necklace is a lovely layering piece. A blue patina has been sealed on a delicate brass chain. 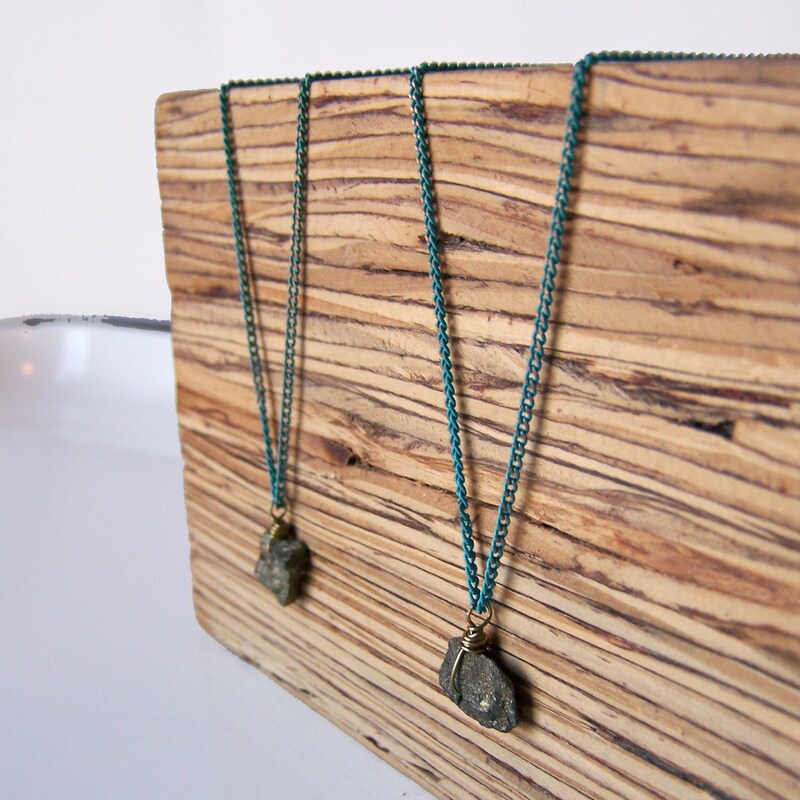 the rugged pyrite stone floats freely on the necklace. Measures 18" and is finished with a brass lobster clasp. Necklace will arrive wrapped and ready for gift giving. Accepted forms of payment are credit cards (Visa, Mastercard, American Express, Discover), and regular payments through Paypal. When paying for your order, your secure information is fully encrypted. Processing time is 3-5 business days. This does not include shipping. All items are handmade, so there will be small variations in natural materials and design. These are the details that make for unique craftsmanship and handmade beauty. Shipping is through United States Postal Service First Class mail. Shipping times are estimates and cannot be guaranteed unless using Express mail. Shipping times should be added to the current order production time to estimate time of arrival. If you need your order sooner than these allowances, please message me and we’ll see what we can do! International Shipping is through United States Postal Service International First Class Mail, unless a different method is arranged prior to order placement. I ship all international orders with insurance, at no extra charge. Please keep in mind, I have no way to track an international package, and no control of delays with customs or customs fees charged to buyers. All taxes, duties and customs fees associated with international shipping are the responsibility of the buyer. Shipping times can vary greatly. International orders should allow 2-6 weeks for delivery. If you prefer a faster delivery or insurance on your item please contact me for any shipping upgrade questions. I cannot be held responsible for international lost orders. Please understand that once it leaves my hands it is now in the responsibility of the US Postal Service to get it to you safely. You also have the option to add insurance to your item to insure your order. If for any reason, you are not satisfied with your jewelry, you may return it for a refund, minus the cost of shipping. You must return the item or items within 3 days of receiving your purchase in order to receive a refund. Items must be in original packaging and unworn. I do not refund lost orders. I am currently accepting new wholesale orders, and have extensive experience as a wholesaler and a retail buyer. If you’re interested in carrying Inspired South products in your store, please contact me and we can further discuss. Discounts are offered for multiple items and personalization is available. Many of my products are great for wedding favors, attendant gifts, and other events. Please contact me and we can make great things happen for your event! It is recommended to minimize interactions with salt water, chlorine and chemicals from perfumes, oils and lotions whenever possible. Pieces will develop patinas at different rates, depending on the wearer’s skin and body chemistry. When not in use, give your pieces a quick clean with lukewarm water and mild soap. Completely pat dry with a soft cloth, and put away in a box or airtight bag to minimize tarnishing. Use a polishing cloth to keep pieces clean and shiny. These precious metal finishes are best cleaned with lukewarm water and mild soap. Finish with a soft polishing cloth, and store your jewelry clean and dry. Do not use abrasive cleansers on these metals. Natural brass and copper are wonderful to work with and wear, as they develop a rich patina over time. Cleaning with lukewarm water and mild soap, and storing your jewelry clean and dry will keep the piece clean, but preserve the patina. If you’d like to bring back the shiny, new finish of your copper or brass, rub it with a bit of lemon juice and water. Rinse and pat dry before storing.